THE new government’s cabinet ministers have a cumulative experience of thousands of man-hours. Mostly, however, as leaders of the previous opposition parties, or in disciplines not related to the management of a country. Hence except for Prime Minister Tun Dr Mahathir Mohamad and Home Minister Tan Sri Muhyiddin Yassin, the rest of the ministers are still learning the craft of managing Malaysia in an honourable, respectable, acceptable and credible manner. 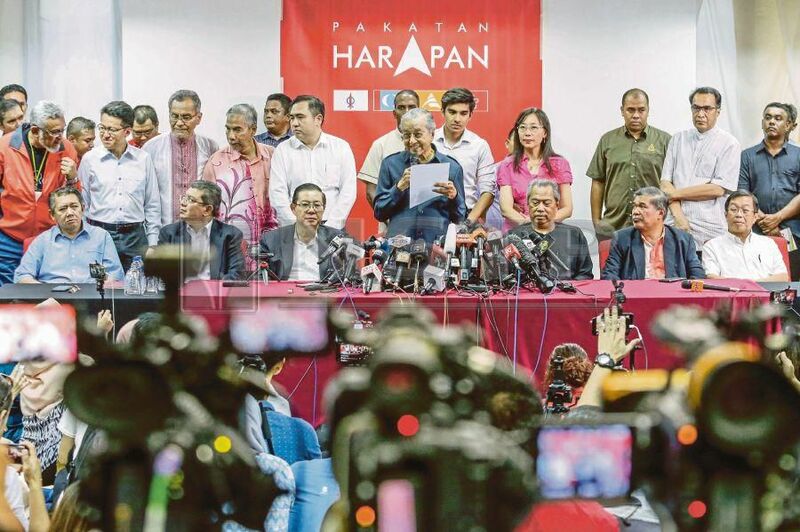 The Pakatan Harapan government is facing this dilemma because Malaysia had just gone through a democratic change in its ruling party. But this could be improved if the new ministers could strive together with a common mission and vision. However, they should not blame Dr Mahathir for not nurturing them to be respectable, honourable and knowledgeable reformers. Respect, honour and knowledge are to be ascribed and not prescribed. Unfortunately, while the majority of them are enthusiastic in discharging their duties for the country and the people, a few of these ministers are plagued with absurdity and arrogance. Their first priority agenda is as absurd as deciding the choice of black or white shoes for schoolchildren, or as arrogant as refusing to accept the significance of national sovereignty versus universal values. These ministers, however, blamed the local media when they fumbled, flip-flopped or were embarrassed by their own absurdities. They are clueless that their behaviour could erode the credibility, integrity, legitimacy and the security of the PH government. Malaysians are watching the above phenomena. The optimists hoped these ministers, would in the shortest possible time, get adapted to the positive norms, values and culture of managing a government. The pessimists regard them as liabilities. They also believed these ministers might cause the downfall of the PH government in the next general election. The Malaysian media is equally concerned with what is happening. One leading columnist suggested to the ministers to emulate Dr Mahathir’s leadership image and strategic culture in managing Malaysia. Several others hinted to Dr Mahathir to remove ministers who failed to uphold strategic national core values. Additionally, there are demands from some quarters of the Malaysian public. They want certain ministers to be stripped off their duties due to their insensitivity to the spirit of the Federal Constitution on preservation of national unity. Hence it is pertinent for all new ministers to be reminded of their responsibilities to maintain the security of the PH government or the regime security of the ruling party. This is because regime security is “the condition where governing elites are secure from violent challenges to their rule” [Richard Jackson (2015) in Alan Collins’ Contemporary Security Studies]. They also have to know that regime security is crucial to Malaysia as a developing state. This is due to the fact that “the fate and survival of a Malaysian government or the regime in power have impact on the survival of the state and its national security” [Kamarulnizam Abdullah (2012) in Keselamatan Nasional Malaysia]. All new ministers, therefore, should accept the above misgivings of their colleagues and start to act collectively and accordingly with utmost urgency and sincerity to strengthen the position of the current government. They must also accept the reality that the fate and survival of the PH government and its regime security depends solely on how effectively they manage Malaysia. FIRSTLY, they could introduce a common and new mission statement as guidance to their ongoing reformation endeavour. This could be done by dissecting and digesting Dr Mahathir’s Wawasan 2020, since the secret of the prime minister’s total dedication to Malaysia and its people is entrenched in this doctrine. This is because Wawasan 2020 is a doctrine for reform based on Malaysia’s own mould. Wawasan 2020 was also formulated based on Rukun Negara as our country’s national doctrine for peace, unity and prosperity. In an interview, Professor Suedo Sudo of Nanzen University, Japan, told me that “Vision 2020 can be regarded as an extension of the Look East Policy. This is the reason why Asean wholeheartedly adopted a similar vision in 1997”. Of course, this mission statement has to be blended with PH strategic goals stated in its election manifesto. This is relevant because “a mission statement has a more ‘present day’ focus and really describes how a company [or a country] plans on achieving its objectives”. SECONDLY, the new ministers could introduce a new vision statement for the PH government also based on Rukun Negara and the Federal Constitution. A “vision statement has more to do with the future and really describes what an organisation plans or hopes to be in the future. This is more of an inspirational or motivational statement”. The above arguments and reminders are highlighted here because the security of the PH government is instrumental to the success of its current institutional and structural reform agendas. In other words, if Malaysia is unstable and the government is insecure due to the behaviour of a handful of its ministers, its reform agenda, too, will be hindered. If this happens to the government, who is to be blamed when this phenomenon is widely construed as a betrayal to Malaysians who voted Pakatan Harapan into power?